Share your favorite Mom Hack. I learned this from my mother-in-law. Right before dinner, I set out a plate of raw veggies and call them “tasty treats.” The kids are so hungry that they gladly eat the veggies and even feel like they’re getting away with snacking before dinner. It’s a brilliant way to get my kids to fill up on healthy food. Thanks, Grandma Lisa! What inspired you to write the MOPS theme song, “Free Indeed”? 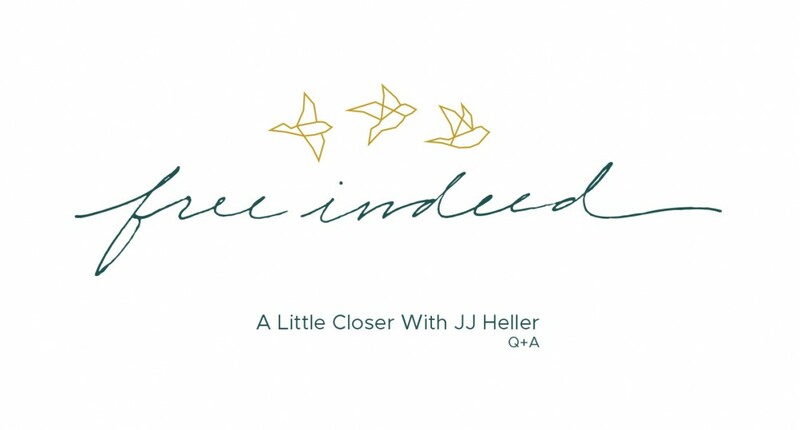 I wrote “Free Indeed” because I allow myself to get caught up in fear, shame and comparison and I need to be reminded that I’ve been set free from all of that. My friend and MOPS CEO, Mandy Arioto, says that most of the women she talks to feel overwhelmed while simultaneously feeling like they’re not doing enough. That sentiment resonated with me in a big way. As a mom (especially with little ones), it’s easy to get discouraged and feel isolated. The lies that we aren’t good enough sound really loud when they’re left to echo inside of our heads. But Jesus says we are no longer slaves to these kind of thoughts. We are free from the fear of failure because he has set us free. And with that freedom, we can face this wild and beautiful life with our eyes and arms wide open. What is it about freedom that speaks to you the loudest? I love that my freedom isn’t dependent on me. Jesus doesn’t say, “Because you fought so hard, you have earned your freedom … Now don’t get lazy and lose it!” Instead he says, “If (I have) set you free, then you are free indeed.” (John 8:36) It’s not about working for our freedom, it’s about remembering that we are free already. I forget this truth all the time, so the song “Free Indeed” is a simple way to remind myself! Tell us why your passion for women and your authentic music and voice connected with MOPS? I love moms so much! I have two little girls (Lucy, 8 and Nora, 5), so I understand intimately the challenges, joys and heartaches of motherhood. Being a mom can feel isolating, so my heart is to write songs and tell stories that remind us how similar and how connected we all are. Last year, I feel like God showed me that I had a bad habit of comparing myself to others. Now, instead of meeting someone new and asking myself, “Am I better than her or am I worse?” my new challenge is to ask, “How can I bless her and what can I learn from her?” It’s a simple change that makes all the difference in how I see myself and how I see others. As women, if we can remember that we’re all on the same team, fighting for the same things, we can be a powerful force of love, peace and reconciliation in the world. Can you give us a quick mom run-down of a typical day at the Heller house? Our adorable puppy, Watson, usually wakes up around 5:15ish (ugh), so I get up with him and listen to a podcast while I take him for a walk. When I get back, I make a pot of coffee (with frothed half-and-half because it’s the best), write in my prayer journal and/or read my Bible before the rest of the family wakes up. I used to make breakfast for the girls every morning (nothing super fancy – bagels, eggs or toast), but then I realized I would be so much less stressed if I just had them make their own! It’s one of those letting-go-of-perfection moments for me, and it’s been hard and good. Then Dave (my husband), Nora and I walk Lucy to school. Nora and I hang out for the morning until our nanny comes around lunchtime, and then Nora goes to school. I have until 5:00 p.m. to return email, update social media, write songs, run errands or whatever needs to be done. It’s super hard for me to switch gears between mom duties and work duties, so I try to only answer interview questions or write songs when I know I have the time and space to do it without kid interruptions. Around 5:00 p.m., I’ll start making dinner and after dinner we’ll take Watson for a walk, play a game, watch a show or read a book together. The girls go to bed around 8:00 p.m. and I start getting ready for bed at 9:00 p.m. since our dog gets up so early. If Dave and I are traveling, our schedule on the surrounding days adjusts to make sure we spend more time with the kids. I’m learning that it’s all about being flexible, giving myself LOTS of grace and lowering my expectations of being the perfect mom, wife and artist. I’m so grateful that God’s mercies are new every morning! Catch an upcoming performance with JJ Heller and MOPS CEO, Mandy Arioto, at PROCLAIM – where mommas come together to proclaim their influence as women, mothers and sisters leading the next generation. Find out more and register below. Hurry! Space is filling up fast.